Before I came here I have never worn any foundation in my life. 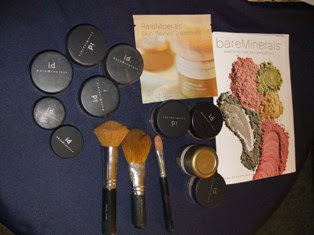 One day while watching tv early in the morning I saw this tv show about bare minerals. It was very convincing though, they showed how to apply the foundation and covers all the black and white heads. Therefore, on that day I was attempted to call their customer service to order a starter kit. I thought why not give it a try where in fact I never used any foundation before. Due to the cold weather when I first got here my skin was so dry, very sensitive and had an allergic. Mind you, when I received my starter kit I applied everyday onto my face after I washed my face with luke warm water until such time I gradually loved it. Guess why? I could see the difference! When I put it on, it covers the small dark spots in my face lol I can't see my black and white heads anymore. Since then, I was so happy with the product I still used it until now. I just got my another kit recently with eye shadow's kit and skin revival treatment. What I like about Leslie's product is, my face look natural very smooth and of course you can't really tell if my face had a lot of dark spots in it-:) I could tell the difference of my face than before using it. Now, I am stocked with them because I can't go out without wearing it. It was very convenient too, when I run out of stock I just give them a call or I order online they will deliver it to my door. I am not advertising their product I just want to know what foundation you've been using since you got here in the US?